Yesterday, the real estate sales numbers for July were released. CNBC was predicting “armageddon”, citing the expiration of the home buyer tax credits as the primary cause of the drop in sales. While the home buyer credit is probably responsible for the April and May spikes, it’s not entirely responsible for the July swoon. As a recent homebuyer who received absolutely no benefit from the tax credits, I’m painfully aware that the tax credit wasn’t the “cure all” needed to fix the housing market. And while dropping prices and low interest rates have historically been a boon for home sales, the biggest issue now is that existing home-owners, a.k.a. home sellers, have less room to cut prices and are stuck staying in their existing house. These home sellers are those who bought homes in the last 4-6 years with 0% to 10% down, and, with falling prices, they can’t pay off their existing mortgage (and a realtor) in any sale, but they’re not Bankruptcy/default risks. Long story short, they’re stuck: they can’t sell and, as a result, can’t buy. The tax credits only helped these home sellers in an indirect way: the tax credit added cash into the transaction that allowed the seller to give the buyer less of a price break. But, the tax credits helped the real estate markets by greasing only one wheel of the car. Now, we have to look at the others. Yikes…banks share some blame, but all of it? Regardless, this article seems to suggest that the banks won’t be doing anything with this bad debt and are happy to get pennies on the dollar. Don’t forget, in Tennessee, a creditor may have up to six years to sue on defaulted debt and, even then, a judgment is good for ten years. Will these debtors still be broke in ten years? On another tweet, the Wall Street Journal reports that business bankruptcy filings are down, while consumer filing rates remain high. From the other side of the coin, Credit Slips reports that, even though default rates are skyrocketing, the numbers of consumer of bankruptcy filings aren’t following that same extreme trajectory–in fact, they are tracking the numbers in the pre-BAPCA (2005) days. 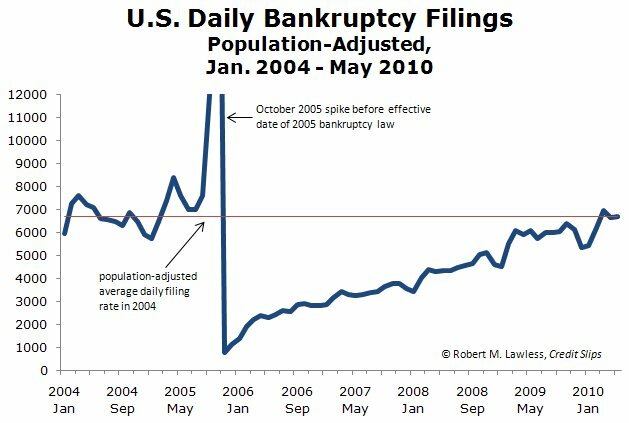 This has everybody stumped: why aren’t more people filing Bankruptcy? This article from the Memphis Commercial Appeal suggests that people aren’t filing Chapter 13s because they can’t even afford Bankruptcy. Yesterday’s post about Quitclaim Deeds of Real Property has spurred a few variations of the same question: what happens to liens on my property when I transfer it to somebody else? With only a few exceptions, a sale of property is subject to any properly perfected lien that is attached to the property. So, if I quitclaim land to you, then any liens on that land remain attached to that property, and I take it subject to those unpaid liens. Long story short, conveying your house to your mother doesn’t make the mortgage go away…it just means your mother owns a house with your mortgage on it. So, as a buyer, it’s my duty to investigate the status of liens on any property that I’m buying and make sure that those liens are paid off or otherwise released (or that I’m content taking the property with the liens). A smart buyer will not only investigate the status of his seller’s title to confirm it’s lien free, but will also look a few “sellers” back, to make sure there are no liens. From a creditor’s perspective, there is comfort knowing that a valid and recorded lien serves as protection of its rights, and the creditor doesn’t need to watch the property transactions on a daily basis. For a buyer, only a complete review of the title records can provide comfort. The Tennessean reported yesterday that Kelley Cannon, convicted earlier this year of murdering her estranged husband, is trying to sell the family’s former $720,000 home to pay her legal expenses. After the initial surprise, the question remains: Can she do this? According to the property records, she’s the only person who can sell the property. That’s because her husband quitclaimed the property exclusively into her name in 2005. The article says that the 2005 Quitclaim Deed was for “estate planning purposes” and because Jim Cannon had bad credit. This is a fairly common practice. An individual entering into a high risk business venture or who sees potential collection lawsuits on the horizon may be inclined to transfer property out of their name and into a “safe” person’s name. The goal is to keep the valuable property out of the reach of creditors, and the “safe” person is generally a trusted relative or friend who has no financial issues. From a creditor’s perspective, these types of transfers may later be avoided as a fraudulent transfer, as long as suit is filed within four years of the transfer. But, there is also risk to the transferor, because he or she is transferring valuable property to a third party but isn’t retaining any ownership interest. Although the Cannon situation is an extreme example, in any such transfer, there’s always some risk that the “safe” person may not stay safe, whether it be a soured relationship or financial hardship. Murders may be rare, but divorce or business disputes happen every day. Think before you quit-claim property. In addition to imposing new notice requirements on foreclosing creditors, the 2010 Tennessee Legislature has also passed House Bill 3057, which provides post-foreclosure protections to debtors regarding deficiency balances. This new law becomes effective September 1, 2010. A “deficiency balance” is the amount of debt remaining after the foreclosure sale proceeds are applied to the creditor’s debt. Because most foreclosures don’t net sufficient proceeds to fully pay the debt, lenders often sue their borrowers to recover this difference. This new statute allows a debtor to question whether the foreclosure sale price was truly representative of the “fair market value” of the property. Under this law, the debtor can attempt to prove “by a preponderance of the evidence that the property sold for an amount materially less than the fair market value…” If successful, the debtor may be able to increase the amount of credit he or she is entitled to. Additionally, the statute potentially shortens the time to file a lawsuit to recover a deficiency balance, requiring that such actions be brought by the earlier of: two years after the foreclosure; or within the original statute of limitations for suit on the debt. For most lenders, this new law should not have any practical impact. While you might imagine there would be various horror stories of lenders bidding $10,000 to buy a half-million property, in reality, most lenders were already calculating their foreclosure bids by starting at what the fair market value of the property is, and then subtracting sale expenses and carrying costs. The most prudent lenders have a standard procedure in place for all foreclosures, and many go the expense to order pre-foreclosure appraisals. The key to avoiding issues under this law is to have some reasonable basis for determining “fair market value” when preparing foreclosure bids, whether it’s the tax records, recent sales, or new appraisals.